Wage rates constitute the price of labor, which is an input in the production of goods and services and thus a factor in aggregate production costs thus prices. This chain of relations makes wage rates a great determinant of economic positions and trends of any financial institutions or nation. With this is mind, it is of importance to note that wage rates are very significant to the national economy as they determine the aggregate demand and supply levels both in the money and goods/products markets both in long and short (Angeles-Castro, et al., 2014) run. On average the Australian wage growth has been low across all its states and industries both in its private and public sector. Holding the quality and quantity of labor constant the price of labor grew by only 1.9% in the second quarter of last year, a growth rate that went into the record as being the lowest for twenty years starting 1997 (The governmnet of Australia; The Treasury, 2017). A broader measure of wages, Average earnings in the national account, which incorporates both salary and wages as well as any other contribution by employers to employees such as superannuation and pension funds among others also recorded slow growth last year (The governmnet of Australia; The Treasury, 2017). This measure of wage rates increased by only 0.1% and notably all other measures of wage rate growth inclusive of average weekly earnings and average weekly ordinary time earnings were also reported to be low (The governmnet of Australia; The Treasury, 2017). The question that hereby sprouts is that of the possible economic effects of this slagging labor price rates growth. 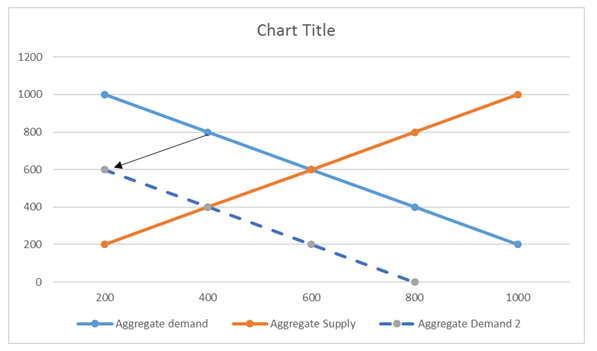 The rule of demand and supply provides that decreased prices warrant decreased supply coupled with increased demand, and this is true to labor as a product. This means that slow growth in wages is likely to attract low growth in the labor force while at the same time yielding increased demand for labor (Razzak, 2015). Basic level the effect of demand and supply for labor would be represented graphically as below. According to this graph, demand is negatively related to price implying that as wage rates decrease, then the quantity of labor demanded decrease. It also depicts that as wage rates decrease, then the supply of labor is positively correlated with wage rates. This is to mean that as the price of labor decreases then its supply also decreases. The declining wage rate growth in Austria is thus expected to have a narrowing effect on labor supply while increasing the demand for the same as employers want to employ more labor at a lower cost while employees are reluctant to take up employment at low pay. 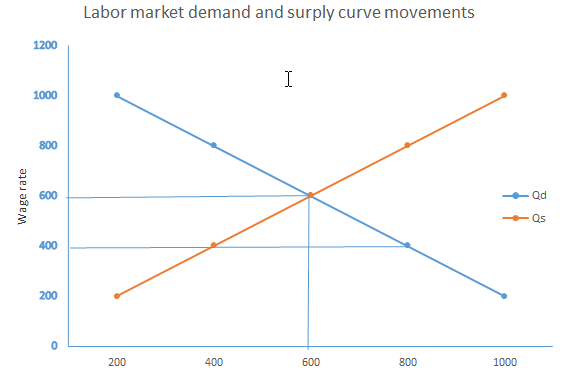 A reduction of wage rate from 600 to 400 leads to a movement along the supply curve that would decrease labor supply to 200. Subsequently, there is a movement on the labor demand curve leading to increasing in demand for labor from 600 to 800. The result is a short term disequilibrium that can, in the long run, be settled through either temporal increase in supply or decrease in demand resulting from the subsequent decrease in demand for products and services. 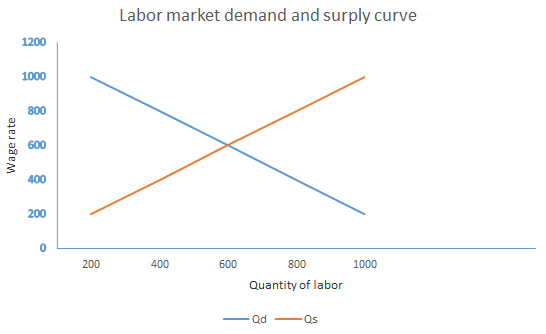 In the event that decrease in labor prices or slow growth of the same leads to decreased aggregate demand (as money supply decreases), then the labor demand curve would in the long run shift downwards to meet the already decreased labor supply as shown in the graph below. Demand for labor at 400 wage rate thus decreases to 400 units creating a new equilibrium were quantity demanded equals quantity supplied. This situation will further lead to higher unemployment rates as some of those willing and able to work either voluntarily remain jobless or are laid in a bid to decrease production costs to match decreased demand. A report by W. A. Razzak seeking to investigate the relationship between wage rates and unemployment suggested that there exists a negative correlation between these two factors (Razzak, 2015). This deduction proposes that as wage rates fall, then unemployment levels go high. The report proves this hypothesis true through a study of the movement of the US employment rates in response to changes in wage levels over the years following the great recession. David Jacobs and Alexandra Rush in different research concurred with Razzak and go a step further to note that there is no specified proportion to which the two wage rate growth and unemployment are related (Jacobs & Rush, 2015). As such they observe that in the past, declined wage growth round the globe has been met by increased unemployment, but that the unemployment levels at any given point and time remained higher than the rate of wage decline. These two researchers also observed that the wage rather than being a production cost also constitute a source of livelihood thus a determinant of national consumption rates (Jacobs & Rush, 2015). Declined wage rate growth thus directly affects the demand for product and services through decreases in consumable funds. David Jacobs and Alexandra Rush, however, observe that the raised unemployment levels resulting from slow wage rate growth are most felt in the short run. With time as firms lay off employees and decrease working hours, employees will be willing to accept the low wages as the forces of demand and supply offer resulting into an equilibrium, only at a lower price and thus economic productivity level. It is thus deductible that declined wage rate growth reduces inflation rates. Wage rate and inflation are positively correlated implying that as wage rates decrease so does inflation rates (Razzak, 2015). This is in line with the general market forces rule whereas wage rates go down, assuming that employees are also shoppers, the demand for goods and services go down. Given the previously high supply level, the initial implication of declined demand is a surplus that forces suppliers to lower prices. This theoretical assumption was however proved true by a research carried out on the economy of the US in the year 2014 (Angeles-Castro, et al., 2014)). 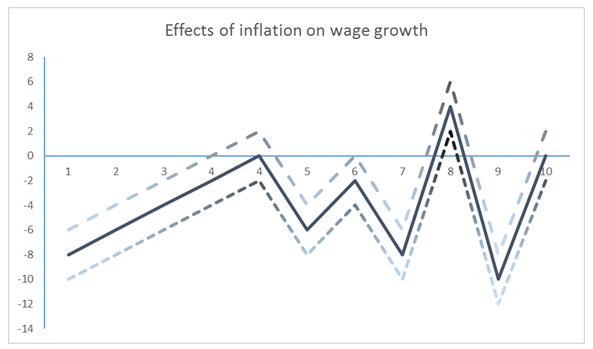 The study concluded that though there is indeed a relationship between wage rates and inflation rates, where inflation rates have a potential of affecting wage rates and vice versa. This means that inclined general prices decrease the price of labor as an input in the production process and that similar change in wage rates has analogous effects general price levels in any way. As such the existing slow wage growth in Australia maybe a result of predicted low inflation rates (Tawadros, 2013). Additionally, the slow wage growth may also act as a source of information in prediction of slowing inflation rates increment. The 2014 article in International Journal of Business and Social Science come up with the following graphic representations of the influence of this two factors on each other. Notable though, the rate of influence is not necessarily equal and thus large decrease in wage growth rate may yield either a larger or smaller decline in general price levels and vice versa (Angeles-Castro, et al., 2014). In regards to GDP, it goes without question that slow wage rates lead to a decreased National domestic product, which is a measure of national income. Similar to the case between wage growth rates and inflation, GDP can either affect or be affected by wage growth rate (Angeles-Castro, et al., 2014). However, the two, from either side are positively correlated so that a decrease in wage growth rate leads to decreased national income and a decrease in national income also leads to decreased labor prices as well as wage growth rates. The ability of wage growth rates to affect national income is based on real income where individuals perceive their income in relation to its purchasing power (Angeles-Castro, et al., 2014) As wage growth rates decline, people predict decline in their income less reducing consumption rates in the short run and due to predicted declines in return on investment they also reduce their demand for investment. A decline in price levels from 600 to 400, due to reduced wage growth as discussed above leads to a decrease in national output from 600 to 400 units. Angeles-Castro, G., Juárez-Cruz, J. & Flores-Ortega, M., 2014. The Effect of Average Wages on the Economy: The Case of the United States. 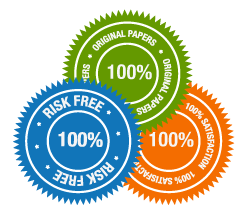 International Journal of Business and Social Science, pp. 30-39. Jacobs, D. & Rush, A., 2015. Why Is Wage Growth So Low?. Razzak, W. A., 2015. Wage, productivity, and unemployment: microeconomics theory and macroeconomics data. Applied Economics, pp. 6284-6300. Tawadros, G. B., 2013. The information content of the Reserve Bank of Australia’s inflation forecasts. Applied Economics,, pp. 263-268. The governmnet of Australia; The Treasury, 2017. Analysis of wage growth November 2017, s.l. : s.n.